Tyron Woodley was quiet about issues facing his life and the lives of other black athletes before. He’s not going to be that way any longer. Woodley told Ariel Helwani on Monday’s edition of The MMA Hour that the death of Muhammad Ali last year made him realize that he has something of a responsibility to speak out when he sees injustice. That is why, he said, he spoke openly about racism last week in multiple interviews, including one on ESPN where he described himself as the “worst-treated” UFC champion ever. Woodley, the UFC welterweight champion, said he has three sons, one or more of whom might eventually become MMA fighters. He said it would be not be right for him to remain silent about issues that he has seen multiple times in his career, going back to his days as a college wrestler. 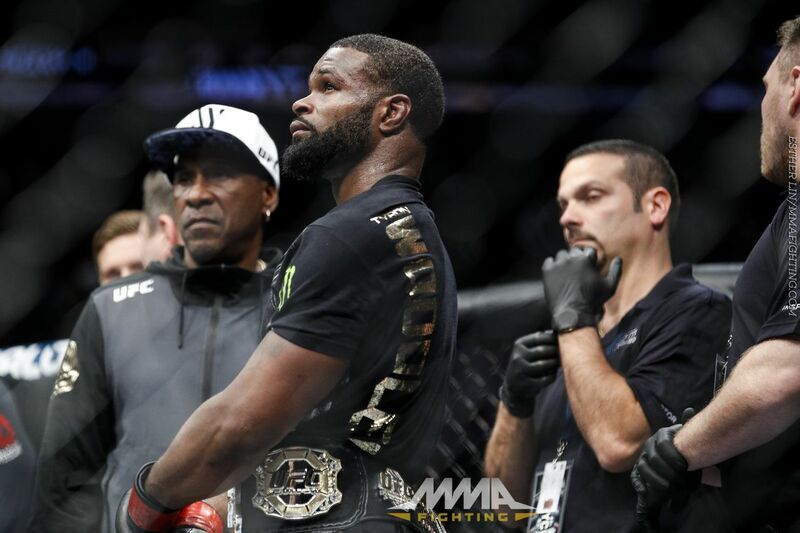 Last week, Woodley said he believed he was the “worst-treated champion” in UFC history and that the color of his skin contributes to how fans see him. Since making those statements, there has been a notable amount of anger toward Woodley on social media. Woodley, 34, said it’s difficult for others to understand what he has gone through, because they have not experienced it themselves. “The Chosen One” defends his title against Stephen Thompson at UFC 209 on March 4 in Las Vegas. Thompson was present during those interviews last week and said he just didn’t see racism playing a part in how Woodley is perceived. “If you look at the history of our sport — and it’s not even just our sport — the history of the American culture, certain things are subliminally racist that people don’t understand are racist,” Woodley said. The UFC contacted Woodley after he made those statements last week, he said, and wants to work with him to amend the perceived slight. Woodley said his friend was talking to him today about his wife just got back from the Women’s March on Saturday, which drew millions of people — women and men — to cities all over the world to walk for awareness of women’s rights. The Ferguson, Mo., native, who has been very active in his community, said he’s beginning to understand that these are multi-layered issues. Woodley wants everyone to know that he’s not trying to play “the race card” as some would call it. This is real, he said. Not race baiting or trying to stir up attention. Woodley is coming out now because he believes, though some will be upset by his words, that he can help people who are going through the same things.